Gift vouchers may only be redeemed at our store (located at Shop 7, 84 on Main Shopping Centre, 84 Old Main Road, Road, Walkerville, Johannesburg South, Gauteng) or via our webshop, as full or part payment for products in stock and supplied by Brew for Africa. Gift vouchers are not transferable, and may only be redeemed by the person whose name appears thereon. A Gift Voucher cannot be used to purchase a further gift voucher, nor can it be exchanged for cash. 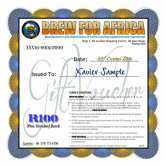 Gift vouchers may also be used to cover the cost of delivery of goods ordered. Any remaining amount is not exchangeable for cash or another gift voucher and will be automatically forfeited. All gift vouchers expire 1 year (12 months) from the date of issue. 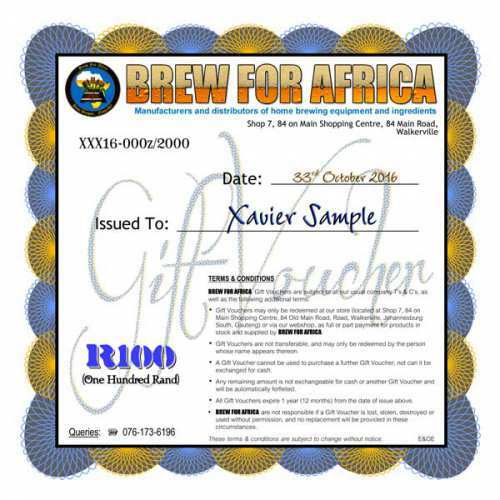 Brew for Africa are not responsible if a gift voucher is lost, stolen, destroyed or used without permission, and no replacement will be provided in these circumstances.